O God, who wonderfully chose the Priest Saint John Eudes to proclaim the unfathomable riches of Christ, grant us, by his example and teachings, that, growing in knowledge of you, we may live faithfully by the light of the Gospel. Through our Lord Jesus Christ, your Son, who lives and reigns with you in the unity of the Holy Spirit, one God, for ever and ever. 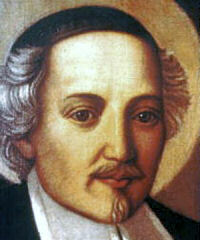 St. John Eudes (1601-1680) was born in Ri and died in Caen, France. Despite the prevailing rigors of Jansenism, he received First Communion when only a child. He studied in Paris and was ordained a priest in 1625. He soon became an outstanding missionary among his plague-stricken countrymen, living an irreproachable life and devoting all his energies to the cause of Christ. In 1643 he founded the Society of Jesus and Mary (Eudists) to preach missions to the people, direct seminaries, and conduct retreats for the clergy. He was a great opponent of the Jansenistic heresy, and always showed an unchanging devotion to the Holy See. Today the Church also commemorates St. Bernard Tolomei, founder of the Olivetan Congregation of Benedictines. Historically today is the feast of St. Louis of Toulouse, the son of Charles II of Anjou, king of Naples. Great-nephew of Saint Louis IX, and of Saint Elizabeth of Hungary. He grew up in Provence (in modern France) and spent seven years as a hostage for his father at Barcelona and Tarragona in Spain. He was ordained at age 23. Born on a farm in northern France, St. John was a religious, a parish missionary, founder of two religious communities and a great promoter of the devotion to the Sacred Heart and the Immaculate Heart of Mary. He joined the religious community of the Oratorians and was ordained a priest at twenty-four. During severe plagues in 1627 and 1631, he volunteered to care for the stricken in his own diocese. Lest he infect his fellow religious, he lived in a huge cask in the middle of a field during the plague. At age thirty-two, John became a parish missionary. His gifts as preacher and confessor won him great popularity. He preached over one hundred parish missions, some lasting from several weeks to several months. In his concern with the spiritual improvement of the clergy, he realized that the greatest need was for seminaries. He had permission from his general superior, the bishop and even Cardinal Richelieu to begin this work, but the succeeding general superior disapproved. After prayer and counsel, John decided it was best to leave the religious community. The same year he founded a new one, ultimately called the Eudists (Congregation of Jesus and Mary), devoted to the formation of the clergy by conducting diocesan seminaries. The new venture, while approved by individual bishops, met with immediate opposition, especially from Jansenists and some of his former associates. John founded several seminaries in Normandy, but was unable to get approval from Rome (partly, it was said, because he did not use the most tactful approach). In his parish mission work, John was disturbed by the sad condition of prostitutes who sought to escape their miserable life. Temporary shelters were found but arrangements were not satisfactory. A certain Madeleine Lamy, who had cared for several of the women, one day said to him, "Where are you off to now? To some church, I suppose, where you'll gaze at the images and think yourself pious. And all the time what is really wanted of you is a decent house for these poor creatures." The words, and the laughter of those present, struck deeply within him. The result was another new religious community, called the Sisters of Charity of the Refuge. He is probably best known for the central theme of his writings: Jesus as the source of holiness, Mary as the model of the Christian life. His devotion to the Sacred Heart and to the Immaculate Heart of Mary led Pius XI to declare him the father of the liturgical cult of the Hearts of Jesus and Mary. He was also the author of several books which served his work, e.g., The Ideal Confessor and The Apostolic Preacher. He died at the age of seventy-nine. Symbols: Priest with or presenting the Sacred Hearts of Jesus and Mary. Learn more about St. John Eudes here and about the order he founded here. Several translated St. John Eudes' books can be found at Bibliothèque Saint Libère. St. Louis's father was King Charles II of Naples and Sicily. Charles, then a prince, was imprisoned by the King of Aragon; as a condition of Charles' release in 1288, Louis and two brothers were sent to Barcelona as hostages. There Louis was cheerful and took part in sports with other prisoners. He was also influenced by the Franciscans, and he prayed with them at night. Louis was given his freedom after seven years when a treaty was concluded with King James II of Aragon. It was proposed that Louis marry King James' sister, but he refused both marriage and the crown of Naples. 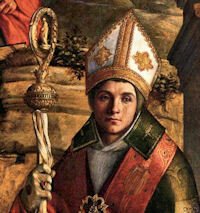 He received a papal dispensation to be ordained a priest and consecrated a bishop at the age of 23. Louis went to Rome in 1296, and five days after being professed among the Franciscans, he was consecrated Bishop of Toulouse. AT Toulouse, Louis was modest, wearing an old Franciscan habit, and his devotion was an inspiration to his flock. Within a few months, however, he asked for permission to resign his office, which he had accepted out of obedience, since he felt that its duties were more than he could handle. He died in 1297, not yet 24 years of age. Bernardo Tolomei son of Mino Tolomei, was born in Siena on the 10th of May 1272. At his baptism he was given the name Giovanni. He was probably educated by the Dominicans at their College of San Domenico di Camporegio in Siena. He was knighted by Rodolfo I d’Absburgo (d.1291). While studying law in his home town, he was also a member of the Confraternity of the Disciplinati di Santa Maria della Notte dedicated to aiding the sick at the hospital della Scala. Due to a progressive and almost total blindness, he was forced to give up his public career. In 1313, in order to realize a more radical Christian and ascetic ideal, together with two companions, (Patrizio di Francesco Patrizi d.1347 and Ambrogio di Nino Piccolomini d.1338) both noble Sienese merchants and members of the same Confraternity, he retired to Accona on a property belonging to his family, about 30km south-east of the city. It was here that Giovanni, who in the mean time had taken the name Bernardo out of veneration for the holy Cistercian abbot, together with his two companions, lived a hermitic penitential life characterized by prayer, manual work and silence. Towards the end of 1318, or the beginning of 1319, while deep in prayer, he saw a ladder on which monks in white habits ascended, helped by angels, and awaited by Jesus and Mary. In order to secure the legal position of his group, Bernardo, together with Patrizio Patrizi, visited the bishop of Arezzo, Guido Tarlati di Pietramala (1306-c.1327) under whose jurisdiction Accona fell at the time. On the 26th March 1319 he was given a Decree authorizing him to build the future monastery of Santa Maria di Monte Oliveto, and instituted “sub regula sancti Benedicti”, with certain privileges and exemptions. Through his legate, the bishop received their monastic profession. In choosing the Rule of St. Benedict, Bernardo accepted Benedictine coenobitism and, wishing to honour Our Lady, the founders wore a white habit. Welcoming the small group of monks, the bishop said: “Since your fellow citizens glory in placing themselves under the patronage of the Virgin, and because of the virginal purity of the glorious Mother, it pleases you to wear a white monastic habit, therefore showing outwardly that purity which you harbor within.” (Antonio di Barga, Cronaca 5). The white habit characterized various forms of medieval monasticism, amongst which the Camaldolese, Carthusians, Cistercians and the monks of Montevergine. With the laying of the first stone of the church on the 1st of April 1319, the monastery of Santa Maria di Monte Oliveto Maggiore was born. The hermits became monks according to the Rule of St Bendict to which they made some institutional changes. The most characteristic element of this institutional change recorded in an episcopal document 28th March 1324, was the temporariness of the abbatial office, and the abbot-elect would have to be confirmed by the bishop of Arezzo. When the time came to elect an abbot, Bernardo succeeded in withdrawing himself from those eligible because of his infirmity of sight. Therefore, Patrizio Patrizi was elected first abbot (1st of September 1319). Two other abbots followed: Ambrogio Piccolomini (1st of September 1320) and Simone di Tura (1st of September 1321). On the 1st of September 1322, Bernardo could no longer oppose the wishes of his brethren and so became the fourth abbot of the Monastery he founded, remaining abbot until his death. An Act dated 24th September 1326 attests that the Apostolic Legate, Cardinal Giovanni Caetani Orsini (†1339), dispensed abbot Bernardo from the Canonical impediment of Infirmity of Sight, hence validating his election. From Avignone, with three Bulls dated 21st January 1344 (Significant Vestrae Sanctitati: acknowledges the foundation and requests pontifical privileges; Vacantibus sub religionis: canonical approval of the new community; Solicitudinis pastoralis officium: the faculty to erect new monasteries in Italy) Clemente VI approved the Congregation which numbered ten monasteries. Bernardo did not go to Avignone himself, but sent two monks: Simone Tendi and Michele Tani. Significant evidence of the spiritual personality of Bernardo consists in the fact that, even though the monks had decided not to re-elect an abbot at the end of his annual mandate, they decided to ignore this, re-electing Bernardo for twenty-seven consecutive years, until his death. Another act of trust in Bernardo’s paternity was seen in the General Chapter of the 4th of May 1347 when the monks granted him the faculty to govern without recourse to the Chapter and the brethren, trusting that he would do all in conformity to God’s Will and for the salvation of all. Bernardo tried at least twice, in 1326 and 1342, to lay down the abbatial office, declaring to the Pope’s Legate and Jurists that he was not a priest but only in Minor Orders, also citing the existing dispensation from his function as abbot because of his persistent infirmity of vision. However his leadership was asserted fully legitimate even according to the canonical norms of the time. With the Pontifical Approbation of a new Benedictine Congregation named “Santa Maria di Monte Oliveto”, Bernardo is the initiator of a resolute Benedictine monastic movement. Bernardo left his monks an example of a holy life, the practice of the virtues to a heroic level, an existence dedicated to the service of others, and to contemplation. During the Plague of 1348 Bernardo left the solitude of Monte Oliveto for the monastery of San Benedetto a Porta Tufi in Siena. In the city, the disease was particularly dire. On the 20th August 1348, while helping his plague-stricken monks, he himself, along with 82 monks, fell victim of the Plague. This hero of penance and martyr of charity did not go by unnoticed, as Pius XII observed in a letter sent to Abbot General Dom Romualdo M. Zilianti on the 11th April 1948, to commemorate the forthcoming sixth centenary of the death of Blessed Bernardo. The venerable abbot was buried near the monastery church in Siena. All the plague-stricken bodies were put in a common pit of quick-lime outside the church. Unfortunately the search for the bodies of the victims of the plague, both in Siena and in and around the Abbey of Monte Oliveto Maggiore, has been unsuccessful to this day.